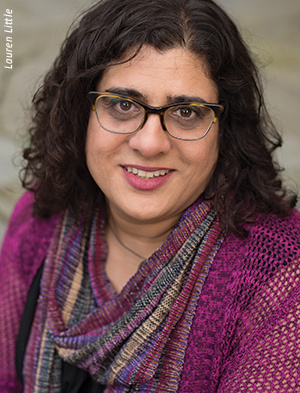 Assistant professor of religious studies, Samira Mehta, Ph.D., spends a year in the District of Columbia exploring the relationship between religion and access to contraception. Deep inside the marbled walls of the Library of Congress Jefferson building, Samira Mehta, Ph.D., assistant professor of religious studies, scoured women and family magazines like Redbook, Good Housekeeping and Reader’s Digest. Archived issues from the second half of the 20th century. She searched newspapers of the same time period for political cartoons. And she digested the writings of Chief Justice Ruth Bader Ginsburg (aka notorious RBG) and Gregory Pinkus, a scientist behind the development of the birth control pill. On leave from Albright during the 2016-2017 academic year, Mehta spent her days—and nights—in those hallowed halls. Having been awarded the Library’s prestigious David B. Larson Fellowship in Health and Spirituality at the John W. Kluge Center, she was spending the year in Washington, D.C. Her project: God Bless the Pill, Contraception, Sexuality and American Religion. “My project thinks not just about the pill but also about access to contraception starting after WWII and continuing to the present. What roles have religious actors—both clergy and laity—played in women’s access to contraception and what were their motivations? It turns out that liberal religious actors, primarily Protestant and Jewish, but liberal Catholics as well, were instrumental in helping women get access to contraception,” Mehta says. “In the middle of the 20th century, Protestant denominations were passing resolutions arguing that family planning is part of Christian moral responsibility. They talked about stewardship of the earth, spacing children for maternal health, and responsibility to not have more children than you can financially and emotionally care for. “This is a conversation of men in the late 1950s to early 1960s,” says Mehta. “They’re worried about the food supply and maintaining a particular kind of middle class ‘Leave it to Beaver’ style family,” she summarizes. As an expectation of the fellowship, Mehta has written an article detailing her research findings to this point in history. Her essay, “Family Planning Is a Christian Duty: Religion, Population Control, and the Pill in the 1960s,” can be found in the book Devotions and Desires. According to Mehta, religious responses to contraception grow more complex when birth control becomes a feminist issue in the 1970s and 1980s. “Liberal religious people stay on board with contraception once it becomes a feminist project, but you see more conservative Protestants splitting off once it’s clear that contraception will allow women to go into the workforce rather than keep them home.” Part two of her project begins here. In the final piece, Mehta will study the religious debates and discussions about contraception that are taking place today. “Corporations versus individuals, like the Hobby Lobby case,” she says. Mehta plans to publish a book after all her research is complete—a five- to 10-year project, she estimates—with research that will take her beyond the Library of Congress. After securing additional fellowships and grants, Mehta will delve deeply into Planned Parenthood archives at Smith College in Massachusetts as well as the American Jewish Archives in Cincinnati, Ohio. She also plans to travel to West Chester County, New York, to visit the Rockefeller Archive Center located in the basement of the renowned family estate, Kykuit, to study the Population Council records. To help her keep all these miles and piles of files organized, Mehta will have the assistance of Sayge Martin ’20 during the summer months. Their Albright Creative Research Experience (ACRE) project is called, “Women, Print Media, and the Searchable Database: A Digital Humanities Archive.” Together, they will build a database to house all of these records, where the material will be sorted and tagged according to subject matter. “Sayge has a background in computer science and religious studies,” says Mehta. “She’s helping me with the technology and I’m teaching her how it is that you sort and organize and explicate the material that you put into a database. How will we retrieve the information? What words are we looking for? We’ll have to read all of these articles and figure out how to analyze them and think about them as we work through them.